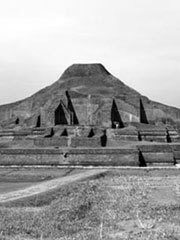 The Mahavihara (Pali for «Great Monastery») was for several centuries the center of Theravada Buddhism in Sri Lanka. It was founded by king Devamampiya Tissa (247-207 BCE) in his capital Anuradhapura. The Mahavihara was destroyed during sectarian conflicts between Buddhists during the 11th century, and was left as such following the abandonment of Anuradhapura in the 13th century.